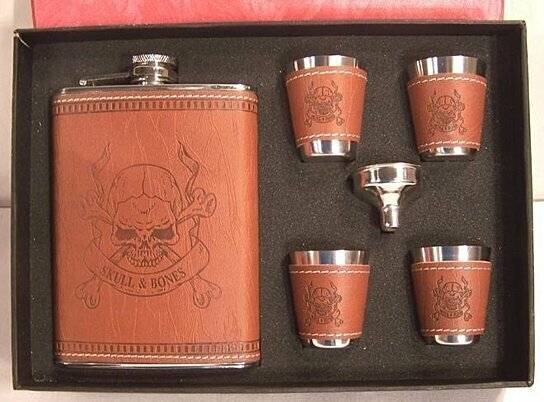 COOL SKULL X BONES FLASK SET! We ship orders within 5 business days after payment is received. If you need quicker shipping, please contact us prior to bidding/buying to arrange that. INTERNATIONAL BUYERS- Please note: SOME ITEMS NOT ALLOWED TO BE SHIPPED INTERNATIONALLY *Import duties, taxes and charges are not included in the item price or shipping charges. These charges are the buyers responsibility.Please check with your country's customs office to determine what these additional costs will be prior to bidding/ buying. We are here Monday through Friday 8:00 am - 5:00 pm MST. We are not here on the weekends or federal holidays. You can contact us anytime through ebay messages. Or you can call us during business hours at 801-631-4026. DUE TO THE HIGH VOLUME OF MESSAGES WE RECEIVE, WE ASK THAT YOU SEND ALL MESSAGES THROUGH EBAY. WE NOT ANSWER MESSAGES THROUGH HOTMAIL.